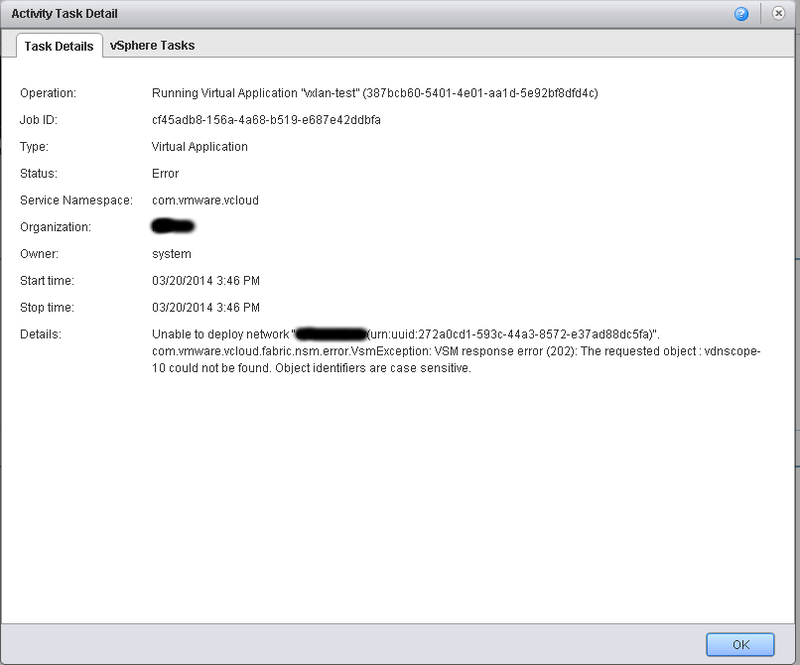 When the recovered VMs are powered on, the mentioned error occurred. A reboot of the ESXi, vCenter and its services and even an ESXi reconnect did not solved the problem, so I started a more deterministic root cause analysis. The recovered virtual machines CD-Drive were referring to an ISO-file on a non-existent NFS datastore that hasn’t been recovered. Unfortunately the error message itself was not pointing to the root cause. hmm, yeah…not very much useful information. 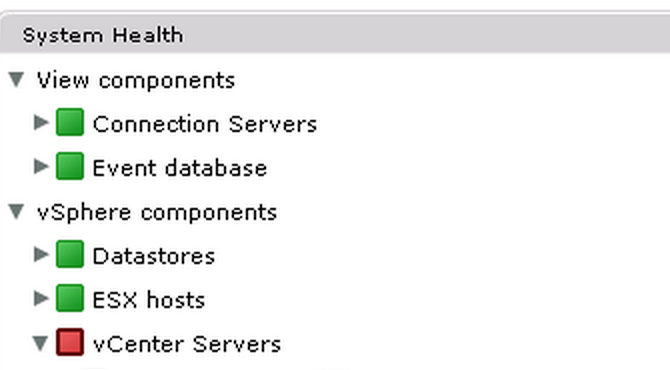 So next step -> checking the hostd.log within the ESXi host. so it seems that we had some kind of IO problems. 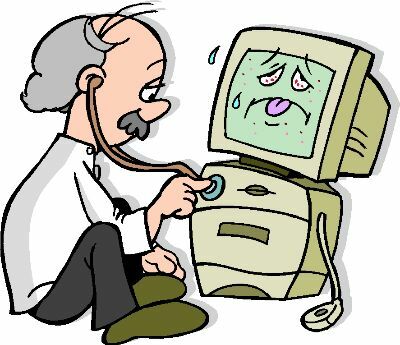 Checking /vmfs/volumes/XXXX we realized that we were not able to access the device. The volume itself was a NFS share mounted as a datastore and as you probably know are also mounted in the /vmfs/ folder of the ESXi. Even though the VMs are running on block-based storage (iSCSI) I found out that there was still a dependancy between the VM and the not-reachable NFS device -> The VMs had an ISO-file from a NFS datastore mounted. During the failover of the storage the NFS datastore hasn’t been restored and the VM was trying to access the NFS share to include the ISO file. A few days ago I received a mail of a former student of mine. They have updated their VMware environment to the latest vSphere 5.5U2 and afterwards Horizon View from 5.2 to 6.0. From a procedural point of view it has seemed that everything has worked fine. But on a second look he has realized that in the Horizon View Manager dashboard the vCenter was marked red (‘service is not working properly ‘) and pool operations were not working anymore. From a systematic troubleshooting perspective I recommended him to check that the connectivity between the Connection and Server was doing fine. OSI Layer 1-4 were working well (ports haven’t been changed as well between the VMware versions). For the connectivity check of layer higher than 4 I told him to check the ‘classical-access-logs’ to see a problem with the authentication. and to verify that the service-account has proper vCenter access and the correct permissions set within a role. And voila –> the service user’s vCenter permission was removed during the upgrade (-> All other permissions were still in place). Maybe a malfunction during the SSO / AD-LDS upgrade. Unfortuneatly I am not able to have closer look to do a root-cause analysis of it. Anyway! If you observe similiar issues –> a) Use a systematic approach to verify system-communication or b) check directly the vCenter permissions. Like this or similar should today’s entry in my non-existing diary look like. It was one of these typical “piece of cake” tasks that turn into nightmares 😀 Literally the task read “Configure VXLAN for the ***** cluster” – easy hmm!? 1. Ok, let’s go: The physical switch configuration turned out easy as it was already done for me 🙂 CHECK. 2. 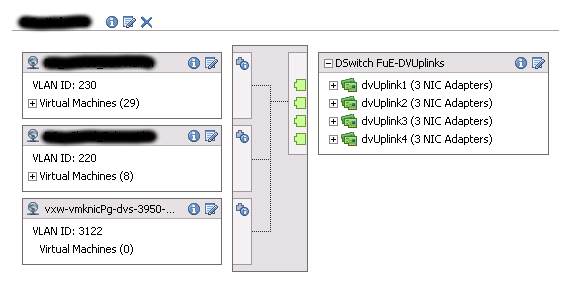 So, naive me, I connected to vShield Manager UI, went Datacenter -> Network Virtualization -> Prepare and added the cluster, gave it the name of the also already existing Distributed Switch and the VLAN ID and let it run. FAIL: “not ready”. domain-c3943 already has been configured with a mapping. 5. … The Port Group was not created … f*** this sh***. After a 30ish minutes of blind flight through VSM and vCD, I figured out that other clusters could not deploy VXLANs anymore. Due to this insight and a good amount of despair, I just rebootet VSM. Then unprepare, “curl”-hack, prepare … and: WORKS! 6. No VMkernel Ports were created (I ran out of curses by that time). Another 30min passed until I unprepared, “curl”-hacked and prepared the cluster one last time before the VMkernel Ports were then magically created. THANK GOD! So I went ahead creating a Network Scope for the cluster. I tested creating VXLAN networks over VSM a couple of times and it seemed properly create additional Port Groups. You think the days was over, yet? WROOONG! – Create a Network Scope with the same name as the Network Pool as vCD uses some kind of ID instead of the name of the Network Scope. The only possible solutions I could come up with are deleting and re-creating the Provider vCD or going into the vCD database and do some magic there. The only information on this I could find was in the Vmware Comunities: https://communities.vmware.com/thread/448106. So I am going to open a ticket.